Before we made our day-long journey to Dominica (3.5 hours from Atlanta to Puerto Rico, 1.5 hours to Antigua, 30 minutes to Dominica, and then an hour-long drive to our hotel, with layovers in between), you could’ve written what we knew about the Caribbean’s Nature Island on the head of a pin. Basically, we knew it was one of Ethical Traveler’s Top 10 Ethical Travel Destinations for 2012, and that it was supposedly an ecotourism-lover’s dream come true. But until we got there, we honestly had no clue what to expect. Our home base for the week was Rosalie Bay, an eco-luxury resort with a strong focus on alternative energy, sustainable agriculture, farm-to-table cuisine and wellness. 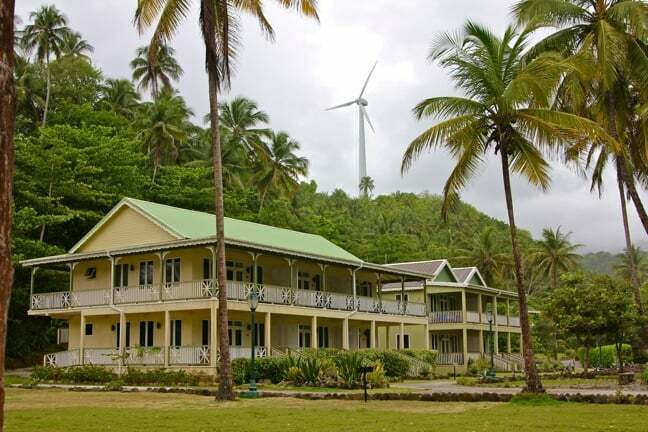 Opened in November 2010 about an hour from Dominica’s capital city of Roseau, this Green Globe Certified getaway was the first luxury hotel on the island, and currently gets a significant portion of its energy needs from the wind turbine you see here as well as solar panels on the property. With the steady breeze coming in off the Atlantic, it was a perfectly picturesque place to harness nature’s power. The setting here was so serene, we ultimately regretted having such a jam-packed itinerary that we didn’t get much time to explore it. 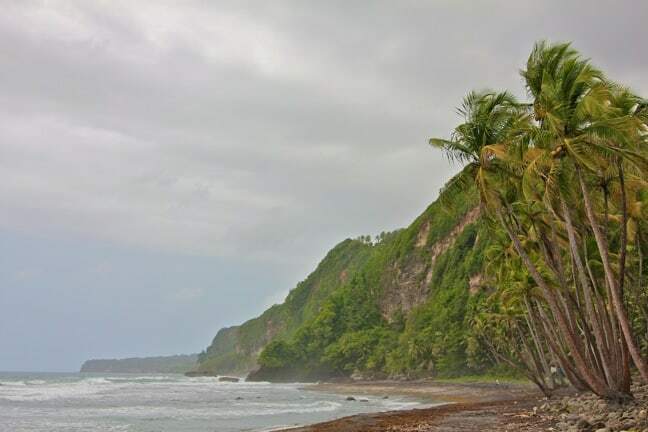 In addition to their oceanfront Kalinago Spa (which we never had a chance to visit), the resort offered yoga classes, massage lessons, cooking light classes and wellness coaching on site. 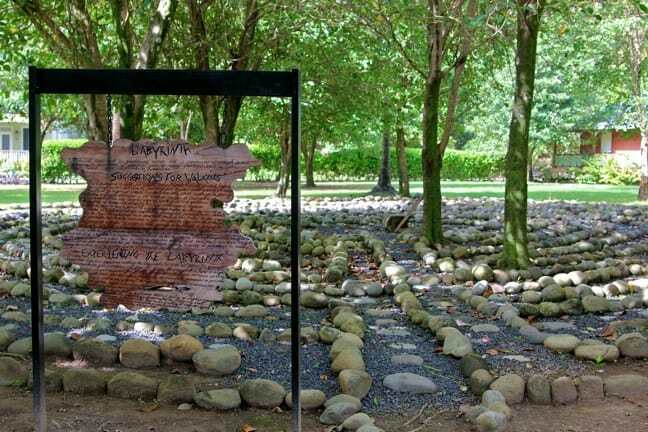 Fortunately, we woke up early enough on our first day to stroll the grounds a bit, enjoying a few sacred moments of quiet reflection at their stone labyrinth and serene koi pond before heading out for our first adventure. Our first stop took us into the Morne Trois Pitons National Park (a UNESCO World Heritage Site) and along a brief section of the Waitukabuli National Trail, a 114-mile trail that has become a mecca for avid hikers. Our ultimate destination was Emerald Pool, which we got an incredible overhead view of as we hiked along through the dense Dominican jungle. When we first arrived at Emerald Pool, there were already a few people there, including an older woman who seemed to be enjoying the peaceful serenity and a young couple who arrived at the bottom just before we did. To our surprise, all of them left within about 15 minutes, and for the next half-hour we had the entire place to ourselves! 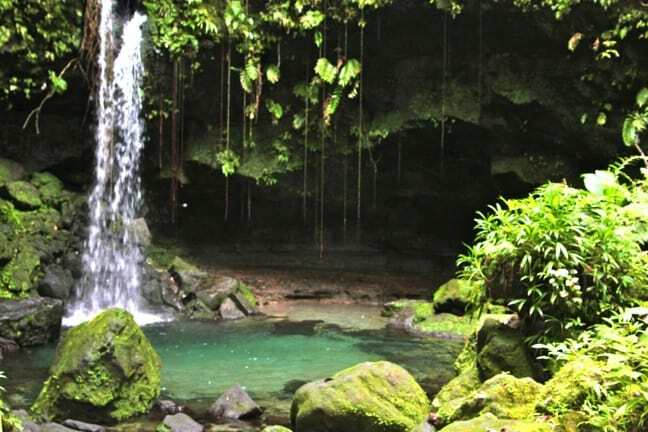 It was as Eden-like as any place I’d ever visited, with cool, crystal clear water surrounded on all sides by lush, tropical greenery. There was even wildlife, in the form of some cute crayfish scuttling among the rocks. Fortunately, we weren’t completely alone: Discover Dominica provided us with a most excellent driver/guide for the week, Oris Campbell, whom we were most thankful for every time he navigated one of the island’s many long, winding, steep mountain roads. 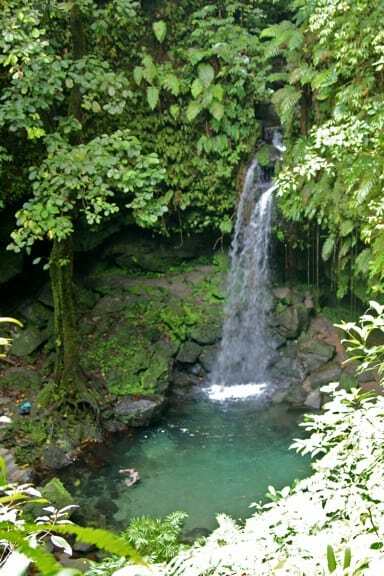 Oris, who’s president of the Dominica Taxi Association, was also quite the accomplished photographer, and was gracious enough to snap some candid shots of us as we swam and frolicked in the Emerald Pool Falls. This was one of the best deep tissue massages I’ve ever had! After our morning reverie, we made our way to Roseau’s Anchorage Whale Watch & Dive Center for our afternoon whale-watching expedition. 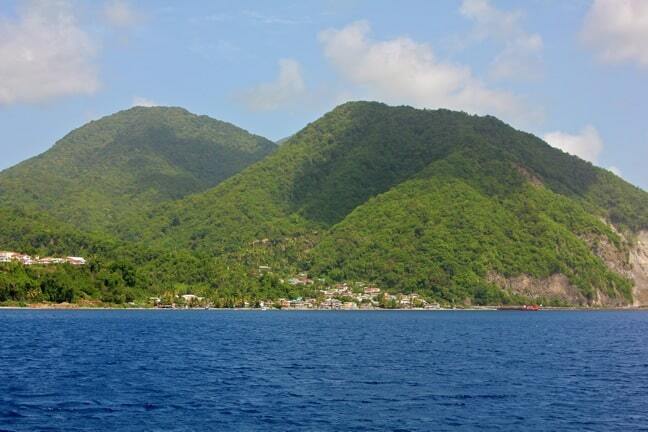 Located next to the Anchorage Hotel, the company is overseen by Andrew and Rhona Armour of Kubuli Watersports. Andrew has earned local notoriety as “The Whale Whisperer” thanks to his ongoing relationship with a sperm whale named Scar, and we’ll have our full interview with him soon. 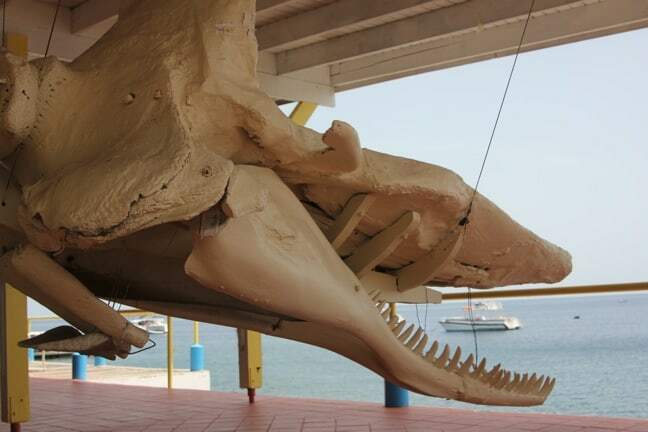 While we waited for our departure time, Mary snapped this great shot of a whale skeleton, which washed up on Dominica’s shores a few years ago and is now the centerpiece of the company’s cetacean education center. 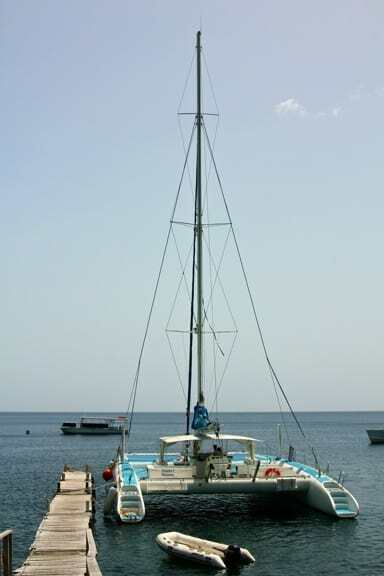 Our Anchorage Whale Watch CatamaranIt was a picture-perfect day on the water, with nary a cloud in the sky (Dominica gets more rainfall per year than any other island in the Caribbean). Mary had never been on a catamaran before, but they’re one of my favorite modes of transport due to their smooth sailing and comfy nets for laying out in the sun. Which we had a good bit of time for, as the whales did not initially seem to be interested in hanging out with us at all. The process by which they located the whales was fascinating. After motoring a few miles out from the dock, the captain (pictured on the left) would stop the boat every so often and his crew would ready a hydrophone. 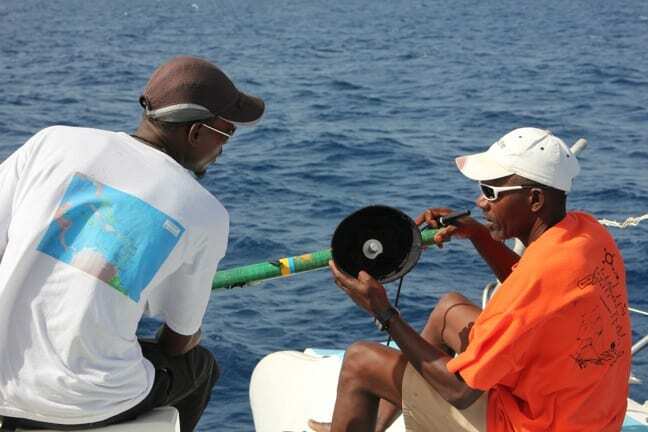 The hydrophone was attached to a long pole emblazoned with the Whale Whisperer logo, which the crew would then lower into the water and point in a certain direction. The sounds were transmitted to a speaker on the boat, and every so often we’d hear the clicking sounds by which whales communicate. Then off we’d head in that general direction. Unfortunately, despite our guides’ assurances that they have an 85-90% whale-spotting success rate, the whales we were tailing seemed a bit camera shy. …and got to know a few of our fellow passengers. 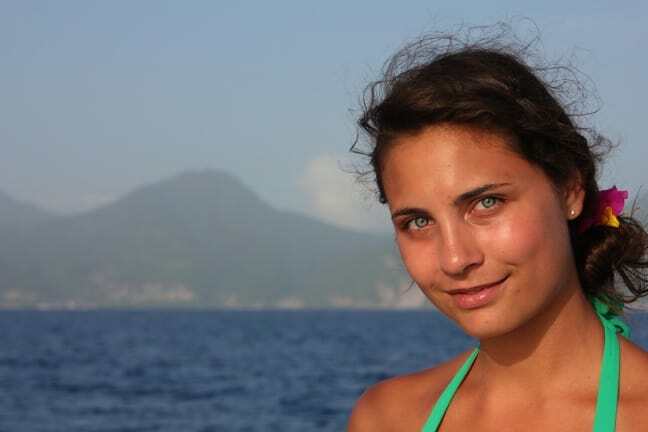 The most intriguing by far was Jocelyn Gruber, a beautiful young lady who had won a free trip to Dominica after entering a contest hosted by a wetsuit company. In conversation, we learned that Jocelyn had done some modeling and had won Miss Pennsylvania’s Outstanding Teen Award. Despite her success in the field during a year spent in New York (including appearing in Cosmopolitan), Jocelyn had decided to go to college to pursue her first love, childhood education, in hopes of becoming a middle school guidance counselor. Such a good head on this young woman’s shoulders! 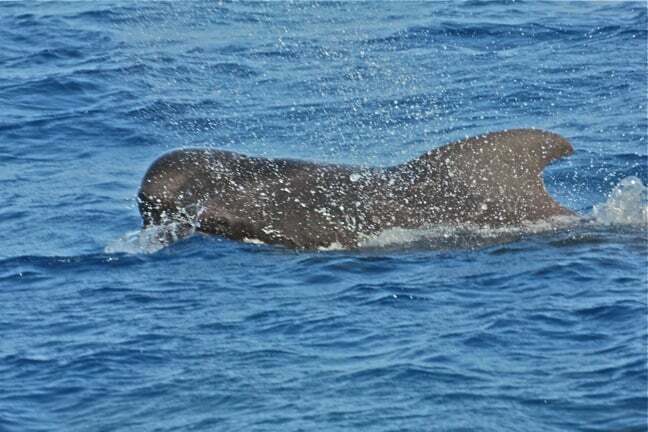 Finally, we discovered the reason why the sperm whales we’d been tracking were so elusive. One of our fellow passengers saw what he thought were dolphins off our port bow, but as we moved closer we realized it was a pod of pilot whales! 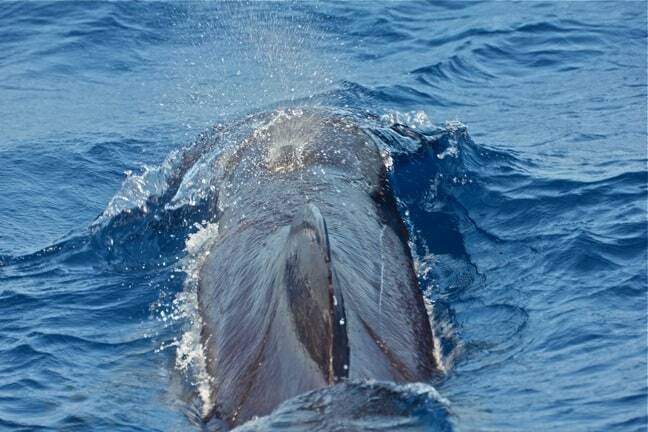 Though they’re one of the smallest cetacean species, pilot whales are notorious for feeding on young or weak sperm whales. So our guides suggested that the sperm whales we’d been following had dived down deep to avoid this obviously hungry pod. We were extremely excited to get so close, and to snap this shot right as this whale spewed water from his blowhole. It was just before sunset, prime feeding time, and this pod of about 20 pilot whales was clearly looking for prey. We’d seen tons of flying fish on top of the water that day, and we quickly realized that the whales were working together to hunt the fish, swimming just below the surface in an effort to herd them to the top of the water, then suddenly bursting out of the surf to gobble them down in an eruption of spray. It was incredibly exciting to watch, especially since there seemed to be pilot whales on all sides of us. We followed the feeding frenzy for quite some time, but eventually the pilot whales had had their fill and disappeared into the ocean’s depths. The sun was starting to set, and after four hours on the water we were eager for shade and sustenance. 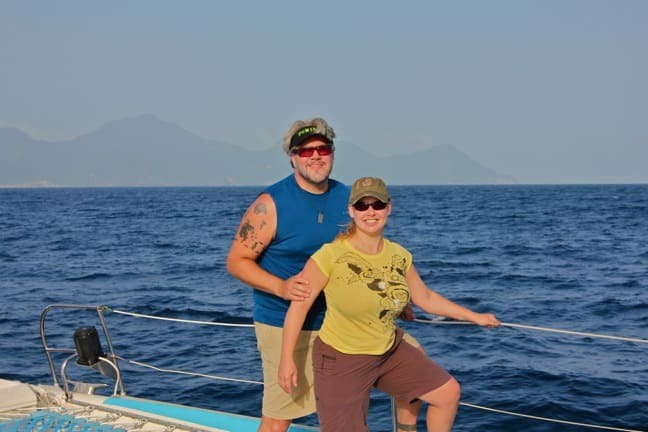 Thanks to our guide for snapping this great shot of us, with Dominica’s rugged coastline in the background. By the time Oris had made the long drive back to Rosalie Bay, it was 7 PM, and we were happy to have our 10-hour adventure come to a close. After a hot shower and some cooling off in our air-conditioned room, we made our way to the resort’s critically acclaimed Zamaan Restaurant. 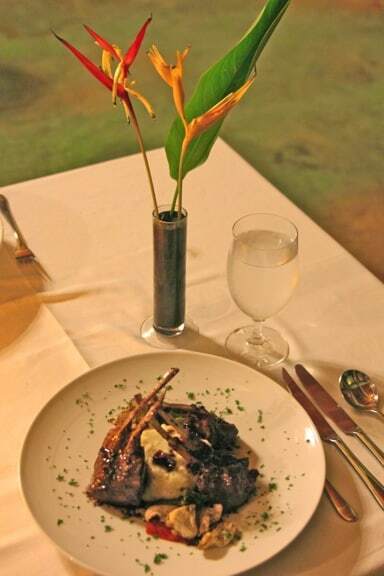 Situated right where the Rosalie River meets the Atlantic, the open-air restaurant was arguably among the best we’ve tried during our travels, serving up simple-but-elegant meals that never failed to satisfy.